The vole is a close relative of the rat and mouse, the vole can be distinguished from either of them by its blunt snout, tiny ears and short tail. There are six species of vole which live in the UK. Some are only found in specific areas such as Microtus arvalis orcadensis found in the heather and pasturelands of the Orkneys and Microtus arvalis sarnius which lives in the short rough grassland of Guernsey. Both of these are sub-species of the western European Common vole (Microtus arvalis). Distribution: throughout British Isles (except northern Scotland & Ireland), and Europe (except for southern parts of France, Portugal, Spain, Italy & Greece). Also USSR, SW Canada & north western parts of North America. The droppings are about 1cm long, regularly shapes and rounded at the ends. They are normally green in colour and relatively odourless. When broken open they are clearly green inside. Another sign of the water vole is a area near the burrow which has been very close cropped (You could practice your putting) on top of a bank. This is due to heavily pregnant females not venturing far from the burrows and simply popping their heads out and grazing around the edge of the burrow. Size: Male - head and body, 20cm; tail, 12cm; Female slightly smaller. Uniformly brown or black, sometimes with white patches. This species lives for 2-3 years. General Facts: The Water Vole lives along banks of canals, slow moving rivers, lakes and marshes and is about 8 inches long. It is sometimes incorrectly called the Water Rat, this being a confusion with the Brown Rat which also swims well. The water vole is usually seen as it dives into the water to swim. Its normal tendency is to submerge, whereas a rat stays on the surface. After swimming, the water vole often sits upright on the bankside, feeding on a water plant or washing its face. One sign of its whereabouts is is a patch of the bank where the plants have been bitten off. There may also be tracks in the mud near by. The water vole has a home territory based on a burrow, the entrance to which is sometimes just below the surface of the water. Male voles live along about 130 metres of water bank, while females have ranges about 70 metres long. They deposit distinctive black/greenish, shiny faeces in latrines. Latrines occur throughout and at the edges of their range during the breeding season. Reproduction: A nest of rushes or grass is made inside the burrow. Breeding usually starts in March and can last well into September/October, depending what the temperatures are like. After a gestation period of 20 - 22 days, the female gives birth .Two to four litters of usually less than six young in each are produced a year. The young when born are hairless and helpless with a weight of approximately 4 - 5 grammes The young grow coats within five days and by their eighth day, their eyes have opened. They grow quite fast and are weaned in 10 - 14 days. 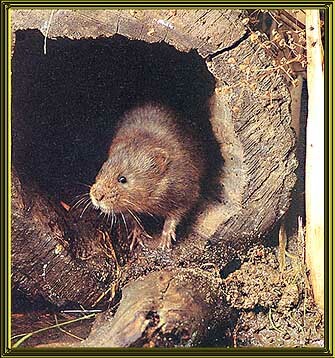 Voles; have many enemies, including mink, weasels, cats, foxes, pike, owls and other birds of prey, and adders. Although reproduction numbers are high, due to habitat loss and heavy predation, 70% of water voles don’t survive through to winter. They have very short lives, from 5 months up to three years in the wild and five years in captivity. Protection: Under the Wildlife and Countryside Act 1981, as amended by Countryside and Rights of Way Act 2000, it is an offence to recklessly damage, destroy or obstruct access to any structure or place which water voles use for shelter or protection. Legal protection is given to water vole habitat because the loss of suitable habitat is the main reason for the dramatic reduction in their numbers. Since April 1998 the water vole has received legal protection through its inclusion in Schedule 5 of the Wildlife and Countryside Act 1981 section 9 (4) only. This offers protection to water vole habitat but not to the animal itself as decline in numbers is mainly attributed to destruction of habitat.